The objective of this conservation project was to stabilize the terracotta (bisque) and the glazing to prevent further damage. Also, to diminish mold growth and to improve the aesthetic appearance of the bright, but faded color glazing. The Sarasota County Courthouse is a historic courthouse building located at 2000 Main Street in Sarasota, Florida. It was designed by architect Dwight James Baum in the Mediterranean Revival style and was built in 1926-1927 by Stevenson and Cameron, Inc. The Texas White House was officially opened to the public in August 27, 2008. The majority of the rooms had been restored to their original appearance at the time when Mr. Johnson was president. Among Lady Birds’ selection of decorative elements for the ranch are the wallpapers for the presidential couple's bedroom, and the children and guests rooms, as well as the bathrooms, on the first and second floors. Over the years termites and silverfish ate through the material giving the wallpaper a colander-like appearance. Water filtering through the window produced stains, wrinkles and discolorations. The conservation of the historic wallpaper was very challenging however very rewarding as well. The project was finished in 2013 and will be opened to the public soon. The Conservation of Historic WPA Murals in Key West. William Hoffman, originally from Savannah, Georgia, was one of the many artists invited in the late 1930’s to beautify the city of Key West as part of a rehabilitation and beautification program to promote tourism. This was ignited by the Work Projects Administration (WPA). The stated purpose of the program was to provide useful work for millions of victims of the Great Depression and thus to preserve their skills and self-respect. Since 1936 the murals were the focus of attention for the students, teachers, alumni and parents, who today still hold fond memories of their time at Key West High School. In 2013 the murals were removed due to remodeling of the structure completed by Bender and Associates and to reopen as the Key West City Hall. The Murals were carefully transferred to the Custom House Museum on Front Street in Key West for conservation. After almost a year of being exhibited at the Custom House Museum, the murals were restored and then moved toKey West International Airport. The prior conservation, move and installation was very challenging and was graciously completed with the efforts of contracted professionals, volunteers, and county staff. The murals are presently being appreciated at the Key West City Hall. Curious about this exciting project's journey? Visit my blog page to view the multiple photographs and learn about the step by step conservation. Conserving WPA Murals in Key West City Hall. The ranch is located in Orange County California. The 24 original ranch structures are still standing and serve as the headquarters for OC Parks. The park was once one of the largest producers of Valencia oranges as well as the leader in dry farming and livestock. The County established this park in 1966. The conservation treatment included repair the structure damage on the substrate. The plaster was detaching from the walls and it was consolidated from the front as well as from the other side of the wall. The wallpaper was surface cleaned, small detachment adhered back and fills and retouch was done on areas with losses. The hall is a 10 stories building that was dedicated as Patriotic Hall by the Los Angeles Board of Supervisors in 1025. It serves as the home of the Los Angeles County Department of Military and Veterans Affairs. Three mural paintings conserved are dedications to the history of American wars in at land and sea. On the basement the two large mural painting designed by Frank Ackerman depicts naval war boats at sea from War World l. On the 6th floor by the same artist a monumental triptych represents a map of “D” Day and battle locations in the North of France. Another very large mural painting on the 4th depicts battle ships during wars on the Pacific. 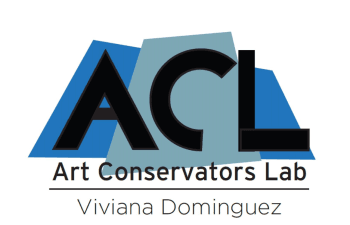 Conservator Viviana Dominguez received the Los Angeles Conservancy Award 2-14 for her conservation work on all three mural paintings. This project consisted of restoring a mural painted by Ferdinand Burgdoff located in the tower of the Hotel del Monte in Monterey, California. The Hotel del Monte first opened its doors in 1880 as the first luxury resort complex in the United States, until it was purchased by the US Navy during WWI, and now functions as an office and hotel for the Naval postgraduate school. The mural artist, Burgdoff (1881-1975), was a Cleveland-born artist, who lived and studied art in his hometown, worked in Paris, and then went on to live the rest of his life in Monterey. He was known for his romantic and stylized landscape paintings of the Southwest desert and the Monterey peninsula. The Desmond building, on Wilshire Boulevard (Los Angeles), was built in the late 1920’s by architect Stanley Underwood as part of the Miracle Mile project. The Art Deco-Streamline Modern Building is an icon on the Wilshire corridor. After being neglected for decades the decorative ceiling on the entrance were painted over and over with latex paint in an attempt to cover the damaged paintings. The conservation treatment consisted on removing the layers of over-paint, restituting the drawings and original color as well as the silver-leaf on the stepped ceiling.